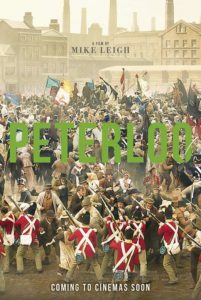 Our next screening at Liverton Village Hall Community Cinema will be on the evening of Sunday April 28th (7pm): Peterloo – the critically-acclaimed Mike Leigh film concerning an important, though little-known, episode in this country’s history – NB, this film is Classified 12. See the Trailer here; see a Review here. Places can be reserved (maximum 2 per person) via the ‘Confirm RSVP’ button below, with payment then due on the door (£3 each) – please only reserve if you are sure that you will be coming (and notify us if you then find you cannot come). Any places still available on the night will be at the same price. Doors will open at 6.15pm, with any unclaimed reserved places being released at 6.40pm. The film will start at 7.00pm prompt! Refreshments will be available; over-18s are welcome to bring their own alcohol (and take away empties!) – we aim to make this a convivial atmosphere, and encourage socialising before and after the film screening. Bring a throw and/or cushion for your seat for extra comfort if you like – or even a fold-down camp chair if you would find this more comfortable!